Home educator Laura Berquist presents a modern curriculum based on the time-tested philosophy of the classical Trivium—grammar, logic and rhetoric. She has given homeschoolers a valuable tool for putting together a "liberal arts" curriculum that feeds the soul, as well as the intellect. Her approach, covering grades K - 12, is detailed and practical, and it is adaptable by parents and teachers to any situation. This third revised edition includes a much expanded section for a high school curriculum, and an updated list of resources for all grades. An important read for anyone planning to use Berquist's curriculum, whether through Mother of Divine Grace academy or independently. As with any homeschooling plan, parents will want to use freedom and discretion in choosing which materials and texts they will use. Yet the traditional approach advocated here is exactly what I would want for my children, and I am excited to be getting started with it. Especially well suited to traditional Roman Catholics, but aspects of the approach can be used by anyone. Note that the edition I am reviewing is an older edition, and an updated one is available. We use this book for our homeschool cirriculum. We want our children to have a classical catholic education. This book is perfect for our needs. It starts off pretty easy in kindergarten and helps develop a love of learning. Each year builds on the last. She suggests many different texts and books for added knowledge. She gives a detailed list of books for each year and explains why she uses them. I think this and The Well Trained Mind are both must haves for a classical education. I don't need to repeat all the stellar raves about this book. Others have described the content very well. For me what really nails this as an excellent resource is that it is so very respectful of the child and the stage he or she is at. Unlike the Wise book, or other curriculum providers, Laura lets young children be young. There's no need to do a formal grammar program with a second grader. With lots of time and drill and sometimes frustration, the child will understand, but developmentally, they are just not ready for the material. That is not to say that the recommendations in high school are light. She knows that teenagers need to be challenged and given a place to channel their energy ands need to argue :-) even my child who struggles with learning has flourished with this program. He is able to write a well structured essay and listen critically to arguments. This is all thanks to DYOCC. 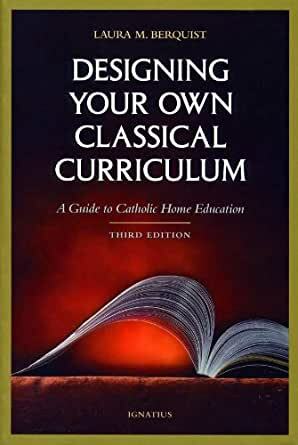 Laura Behrquist delivers an easy to understand and follow guide to setting up your homeschool curriculum. I am using this with Susan Wise Bauer's book "The Well-Trained Mind". I feel like my children are flourishing with a mixture of the two thoughts. Behrquist gives very detailed guided lists for each grade level and a schedule (although the schedules are a bit more vague as far as time allocated to each subject). I like that she focuses SO much on Catholicism and American history in the early years. I liked it so well that I gave it to a friend who is thinking of homeschool so that she could "see" what a typical day might look like. ...for anyone even thinking of homeschooling. This gave me the resources/courage I needed to get started.